The Hooghly college at Chinsura, on the banks of the Hooghly river, was founded by philanthropist Hazi Muhammad Mohsin on 1 August 1836, under administration of a private trust. It was housed in a Palladian mansion built by General Perron, the French General who became the commander-in-chief of the Scindia army and surrendered to Lord Lake in 1803 in the Anglo-Maratha war. Hooghly Mohsin College is one of the oldest heritage and prestigious institution of liberal arts and sciences college in Bengal, situated on the banks of Hooghly River in Chinsurah. The college was affiliated to the University of Calcutta. This glorious House of Learning nurtured some of the doyens of nineteenth century Indian Renaissance, including Sanjib Chandra Chattopadhyay, Bankim Chandra Chattopadhyay, Dwijendralal Roy, Rangalal Bandyopadhyay. 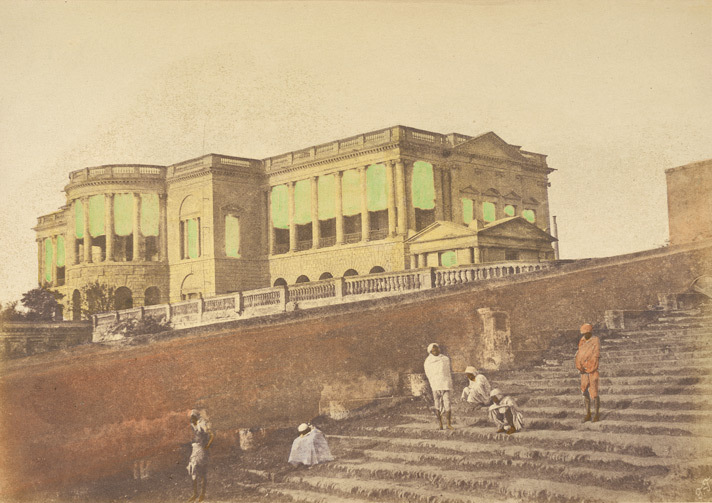 This view of the College at Hooghly with the steps to the ghat (landing-stage) in the foreground was from a hand-coloured print of Hooghly College, from the Fiebig Collection: Views of Calcutta and Surrounding Districts, taken by Frederick Fiebig in 1851. This entry was posted in Educational Institution, English Education and tagged bankim chandra chattopadhyay, chinsura, chinsurah, dwijendralal roy, Fiebig Collection, frederick fiebig, general perron, hazi muhammad mohsin palladian mansion, hooghly, hooghly college, hooghly mohsin college, rangalal bandyopadhyay, sanjib chandra chattopadhyay, university of calcutta.